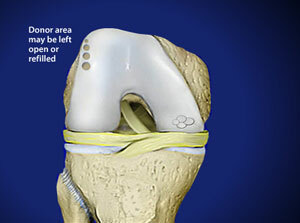 This knee procedure replaces areas of damaged cartilage with grafts of the patient’s own healthy hyaline cartilage. The procedure, also known as mosaicplasty, is performed using small instruments through incisions on the sides of the knee. The surgeon uses a small video camera called an arthroscope to see inside the joint and guide the instruments.